On his third solo album, and first for Merge, M. Ward expands upon 2001's End of Amnesia, delivering soulful, gritty folk-rock, heavily influenced by the classic folk records that most likely line the walls of his house... and Tom Waits. Ward's voice matching the scruffy, emotion-filled, pensiveness of Waits. 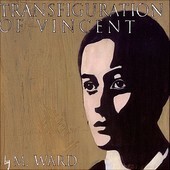 Transfiguration of Vincent, recorded at The Old Joe Clarks' home studio, and engineered by Old Joe Clarks' front man Mike Coykendall, with the Old Joe Clarks acting as Ward's backing band, finds Ward in a more rockin' mood. Songs like "Vincent O'Brien", the album's most sing-along anthem, is filled with buoyant, bouncy melodies, while Ward's voice and stark storytelling abilities conjure up feelings and memories locked deep inside, a smile crossing your face, happy that you're not the character Ward is singing about. With one of the album's other more rocking moments, the swampy, blues-laden folk-rock stomp of "Sad, Sad Song", you once again find yourself singing along, as the searching, the loneliness, and the feelings of abandonment that Ward sings about remind you that you too have been there before. You latch on to the song, singing along in hopes of finding the solution that will free both you and the character in the song. Neither happens. From there Ward settles into the rooted-in-folk sound that you have fallen in love with on previous M. Ward records, and will once again fall in love with this time around. The weepy "Involuntary", the soft, remorseful "Undertaker", and the Vaudeville-esque experimental folk of "Poor Boy, Minor Key" all find Ward at his best, crafting acoustic-based, heartfelt songs of characters long forgotten or lost and their struggle to survive and/or move on. Destined to be a legend a decade from now, listening to M. Ward, you can't help but feel you're listening to history in the making. Transfiguration of Vincent is no exception. A cult hero in the making, and soon to be underground sensation, Ward is a pivotal, underrated songwriter who will make 2003 his year. Transfiguration of Vincent is a testament to that statement. I'll give it an A.